With “markerless” augmented reality, just about anything can be turned into an interactive game. 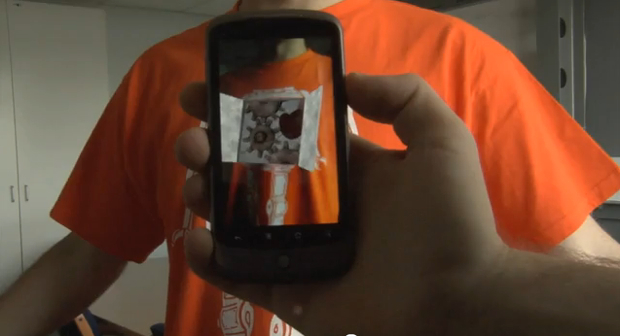 Researchers at Cambridge University have developed a cool augmented reality app called Popcode. An update to the app recently made it available for iPhone 4 and Android, and the app is being featured at the University of Cambridge Science festival being held this week and next. Games can be rendered out of anything, though. Here, a basic balloon popping game comes to life out of a simple printout. It’s a shame Popcode isn’t better known; its forums page is MIA. The team behind Popcode has put together a developers kit if you want to get started making augmented reality experiences of your own. The app and the kit are both free. Popcode eventually hopes to make money through hosting and delivery of commercial content. We’re working at the moment to improve the platform and technology behind Popcode. We’re also engaged in talks regarding partnerships that would see Popcode technology used in a variety of marketing and entertainment products and services. I can’t discuss anything in detail at the moment I’m afraid, but we can be sure that 2011 is going to be an exciting year for Popcode, and augmented reality in general! We’re dreaming up all sorts of elaborate, real-world/virtual-world hybrid games that may come of this, all the cyborg scavenger hunts that could be built. And beyond that, we imagine augmented reality may become more than just a neat party trick.